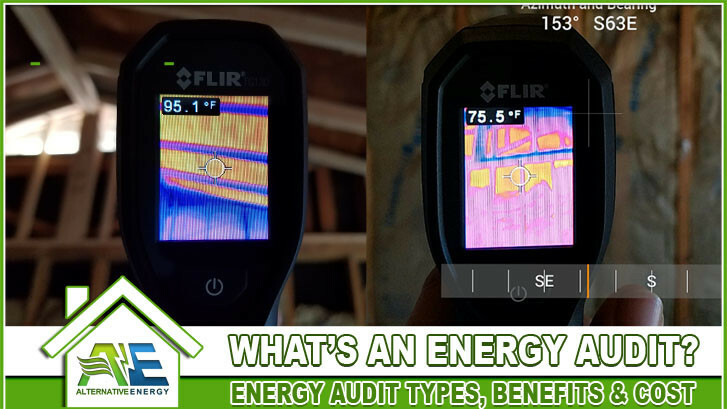 If you’re searching “What is an Energy Audit”, “Types of Energy Audits”, “Benefits Of An Energy Audit” or “Energy Audit Cost“, this post should help! Continue reading to find out what an energy audit is, what types are available, the costs and benefits associated with receiving one. A Alternative Energy, LLC Home Energy Auditor will assess electricity usage and your billing history to help design the perfect energy upgrade for your home. A general assessment of your home will be made, including giving you our recommendations for improving your home’s efficiency, as well as many affordable financing options, to help you save money on electricity. If other utility-based programs are available, one of our experts will encourage you to take further action. A standard home energy audit usually takes about one hour to complete. A full home energy audit is a detailed audit of your home that includes using diagnostic testing equipment. It expands on the standard home energy audit by allowing us to collect more information reguarding the overall state of your homes energy usage, and also a more detailed financial analysis of your current energy costs. A full home energy audit company such as Alternative Energy, LLC will conduct a whole-home inspection to identify and propose energy upgrades for the home. We can proide a detailed report showing you specification and recommendations based on our findings. Alternative Energy, LLC is also a Green Energy contractor that offers a variety of energy products to help make your home more energy efficient and save you up anywhere from 25%-99% on electricity. A full home energy audit usually takes about 3-4 hours to complete. How Much Do Home Energy Audits Cost? Alternative Energy, LLC is one of the only energy audit companies that offers totally free standard and full energy audits. Our Arizona service area includes: Phoenix, Mesa, Tempe, Gilbert, Chandler, Surprise, Peoria, Glendale, Scottsdale and more. Our Texas service area includes: San Antonio, Texas.